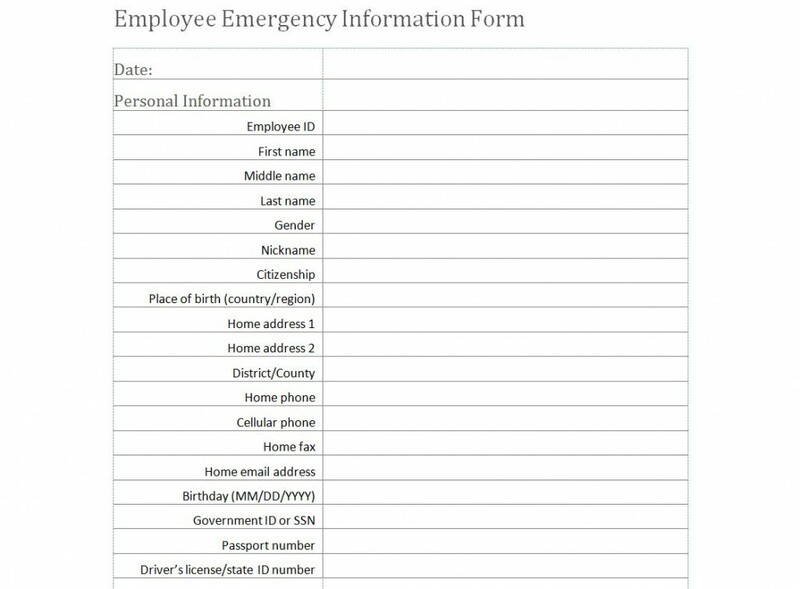 An employee emergency information form contains information that is sometimes included in in the regular employee information form, but in some cases a company may need more information than what is contained in that form. An employee emergency information form will keep a record handy of an any special medical conditions an employee might have, and information on who to contact in case an emergency situation comes up. Emergency situations of any kind could happen at any time to an employee and when they do, having a plan of action in place and the information will help resolve the situation quickly and smoothly. This document unlike most other templates doesn’t need a whole lot of changes to be made to it, but there are a few items you may want to include on the document. You can download the template for free and customize it later. In the list of contact items, you should also include fields for department name, supervisor or department manager, or work location if the company is a large company with multiple work sites. In most cases, the employee’s health insurance will probably be covered in a plan that the company offers, but in some cases the company may not cover employees who only work part time if they are sick or injured outside of the workplace. In that case, the employee may have their own health insurance coverage, or they may also have their own coverage if they like the options that their own plan provides. So the form should include a section for the employee to list their insurance information if it isn’t company-provided. You may want to include a privacy statement on the form stating that all information listed on the form will be kept confidential and only given to parties that have a need to know in case of an emergency. The employee emergency information form should be kept in a location where only authorized personnel can access it due to the sensitive information that is recorded on the form. This protects the employee from identity theft.